My latest craving -- they're changing so frequently these days it's hard to keep track -- has been for anything containing red sauce. One of my husband's constant cravings is for lasagna. And Andrew loves anything that involves tomatoes. So this skillet lasagna fit our menu this week perfectly. We liked this a lot, and it will definitely be repeated in our house. It has all the flavor and feel of a typical lasagna, but it comes together so much more quickly. 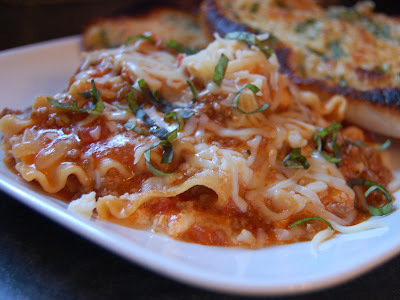 This is right up there with lasagna soup for my favorite alterna-lasagna recipe. I added a couple of things to the recipe, which are reflected in purple below, but I'll make even more changes when I make it again. Joe and I both thought the red sauce was a little bland, so I think next time I'll use jarred spaghetti sauce instead of just plain tomato sauce to add some more flavor. I also couldn't find pre-packaged meatloaf mix at the store, so I used a full pound of ground beef, but I definitely missed the pork component. Additionally, I think this could use a little bit more red pepper, so I'd increase that ingredient to probably about 1/4 teaspoon. This is perfect for a quick and easy weeknight meal, and it's pretty delicious to boot. Thank you, Donna, for sharing this recipe! 1. Pour the tomatoes with their juice into a quart measuring cup. Add enough water to the tomatoes to measure 4 cups. 2. Heat the oil in a 12-inch nonstick skillet over medium heat until shimmering. Add the onion and 1/2 teaspoon salt and cook until softened,about 5 minutes. 3. Stir in the garlic and red pepper flakes and cook until fragrant, about 15 seconds. Add the meatloaf mix and Italian seasoning and cook, breaking up the meat into small pieces with a wooden spoon, until no longer pink, about 5 minutes. 4. Sprinkle the noodle pieces evenly over the meat. Pour the diced tomatoes and tomato sauce over the pasta -- don’t stir. Cover and bring to a simmer. Reduce the heat to medium-low and continue to simmer, stirring occasionally, until the pasta is tender, about 20 minutes. 5. Remove the skillet from the heat and stir in 1/2 cup Parmesan. Season with salt and pepper to taste. Dot heaping tablespoons of the ricotta over the noodles. Cover the skillet and let stand off the heat for 5 minutes. 6. Sprinkle with the basil and mozzarella and serve, passing the extra Parmesan separately. Making lasagne in the skillet is a wonderful idea. Should cut down on dishes. Luv that I don't have to heat up the kitchen with this option.